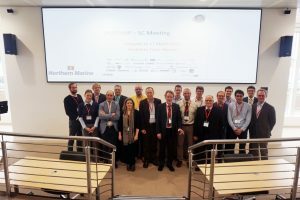 The HOLISHIP project passed its first 6-months mark in March assembling the Steering Group for a meeting at project partner TRITEC Marine Ltd. premises in Glasgow to discuss next steps. While still being in the concept phase the approach for merging relevant tools covering different design disciplines (bottom-up) and the requirements stemming from the multitude of application cases envisaged (top-down) was debated and a firm project development map agreed. HOLISHIP departs from the fact that the design of ships and of maritime assets is in general a complex endeavour requiring the successful coordination of many disciplines, of both technical and non-technical nature, and of individual experts to arrive at valuable design solutions. Likewise complex and of multi-disciplinary nature is ship’s operation. A system approach to ship design and operation for life cycle considers the ship as a complex system integrating a variety of subsystems and their components, e.g. subsystems for the creation of the hull, generation of energy/power and ship propulsion, for cargo storage and handling, accommodation/comfort/safety of crew/passengers and ship navigation. Inherently coupled with ship design and operation and related decision making is optimisation, namely the selection of the best solution out of many feasible ones on the basis of a criterion, or rather a set of criteria. All of the above criteria shall be addressed and covered in the new HOLISHIP platform which is currently developed. The idea for the HOLISHIP project evolved from early experiments with parametric design demonstrators using well established naval architectural software packages (e.g. NAPA®) and their seamless integration with in-house application and optimisation software tools, leading to the successful demonstration of the rationale of the HOLISHIP approach in a series of industry driven case studies for various types of ships. These were conducted either in earlier EU funded projects or joint industry initiatives. 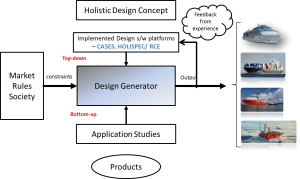 Based on this experience the next logical step was the formulation of a ‘top-down’ approach for a more generic design generator (software) platform indicated in Fig. 2. This is the multi-objective and multi-disciplinary optimisation of ship design for life cycle (Papanikolaou, Computer Aided Design, 2010). In practical terms, HOLISHIP will deliver two integrated design software platforms. The first platform is based on Friendship’s CAESES software and was introduced already in the previous issue of the diary. This will be the project’s prime platform for ship design. The 2nd platform addressing virtual demonstration of complex ship functions and their transient behaviour is the HOLISPEC/RCE platform which is based on DLR’s RCE development. This will be explained in more detail in a future issue. The two design software platforms are now ready for software integration. 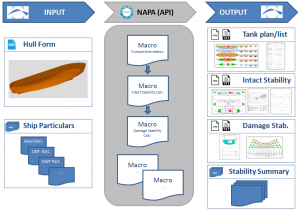 Tools currently being integrated include a widely known naval architecture software package (NAPA) as well as CFD tools for the prediction of calm water hull resistance (ν-Shallo) and motions / drift forces in a seaway (NEWDRIFT) based on potential flow theory. Although these are on-going efforts, test studies using the tools in an automatic optimisation context have already proven the ability of the platforms to provide the environment required for a tight yet flexible tool integration. So far, nine (9) application cases for ship and floating structures design and operational scenarios were formulated by participating industry. These application cases are an essential part of HOLISHIP and it was considered to be relevant that the top-down software development and integration started in parallel to the bottom-up requirement analysis for the application cases. This latter has a series of advantages, namely easy and fast integration of well suited application software tools, early mobilisation of project’s human resources and sustainable contributions to the project’s goals. Even though some of the selected software tools may have limited applicability different but related application studies need only small fine-tuning effort. Other tools such as CFD codes or structural design / FEM codes are sufficiently generic to allow a wide range of applications. The integrated software platform framework (the specified top down approach) ensures a clear integration concept, well defined data flow and handling, diversity of applications and expandability. holistically optimised, superior designs considering in parallel all inherent interactions between different disciplines, e.g. hydrodynamics and structural design which today are considered only sequentially in few design points. HOL ISHIP is being funded by the European Commission within the HORIZON 2020 Transport Programme.